My annual budget for plants is not extravagant, though certainly my wife will disagree. Our property is somewhat over an acre, and much is covered in garden, but I am determined that there is ample space to continue planting for as long as I’m able. With a somewhat limited budget, and marginal enthusiasm on my wife’s part to add to the garden, I must muddle along, taking advantage to divide and transplant, and to encourage seedlings. By late in April the garden is quite overrun with plants, but most perennials have just begun to grow so seedlings pop up in every nook and crack between shrubs and stones in the paths. Most sprouts do not stray far from the parent plants, though a few will be carried some distance across the garden. The trouble is to distinguish between seedlings of plants that should be kept and encouraged, and bothersome weeds. 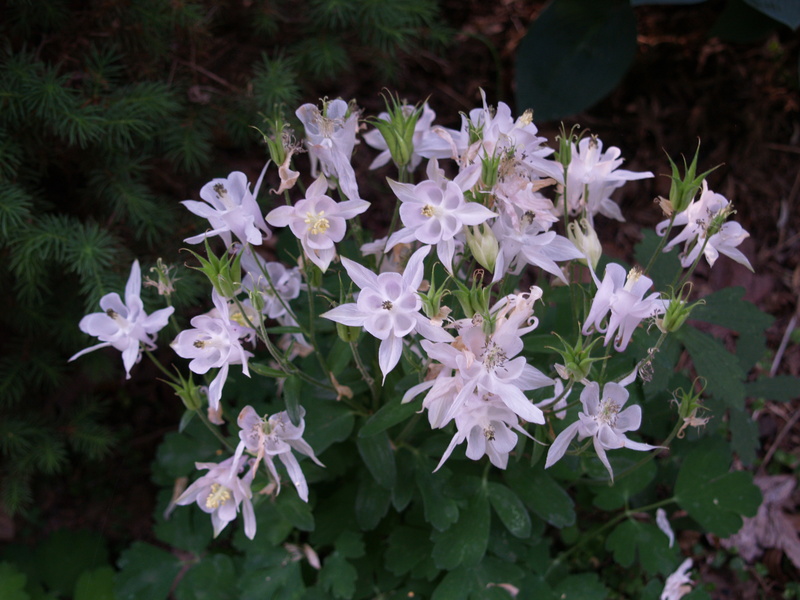 I have become quite accomplished in recognizing the juvenile foliage of some that regularly pop up in the middle of a patio, or in crevices between granite boulders at pond’s edge, but still columbines and tiny hostas are routinely rooted out and discarded when quickness is exercised rather than precision. 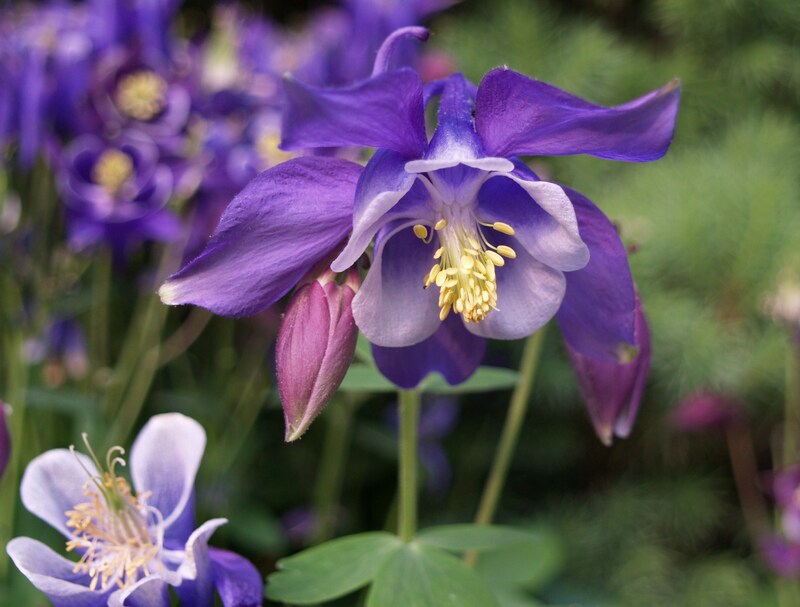 Columbines (Aquilegia, above) seed rather prolifically, and often cross when more than a single cultivar is present. After a few years I haven’t a clue if these are the relatively short-lived originals or seedlings, but there are dozens of seedlings that have popped up on both sides of the stone path, and as I recall, the color of the blooms has not changed. 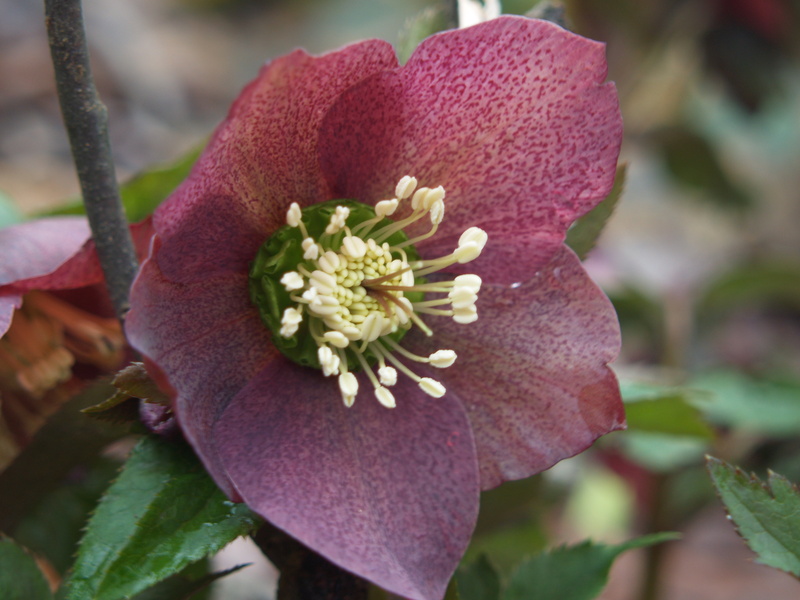 Hellebores (above and below) are quite promiscuous, prone to hybridizing, and seed themselves about, though also in close proximity to the parent plants. I am not observant enough to notice subtle differences in flower or foliage in the seedlings, though with dissimilar parent plants the seedlings are likely to be different. 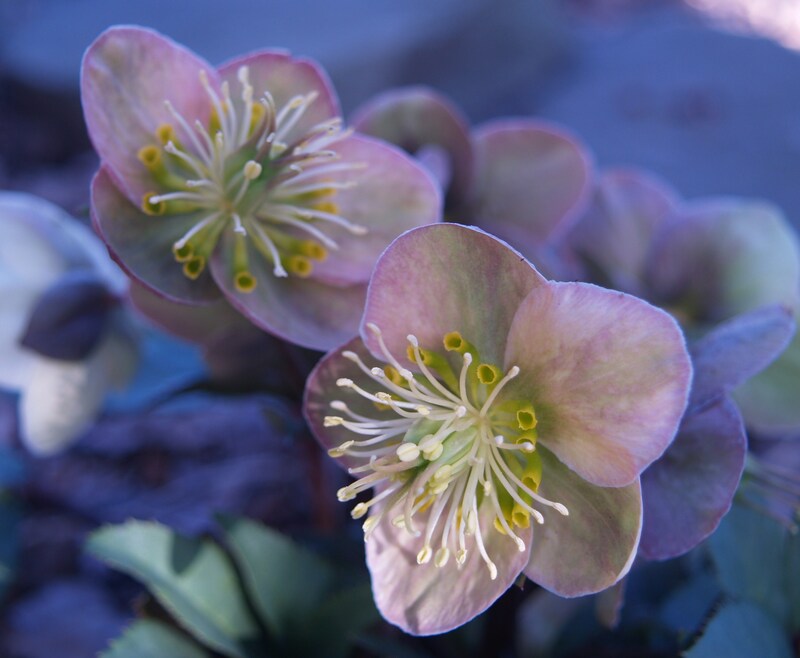 Somewhere in the past year I read a garden writer say that hellebores would be recognized as invasive in the future, and certainly seedlings are numerous, but it is improbable that they will displace other flora. Once the new plants have developed a sturdy set of leaves I have found that they are easily transplanted, and now small colonies have begun throughout the garden. 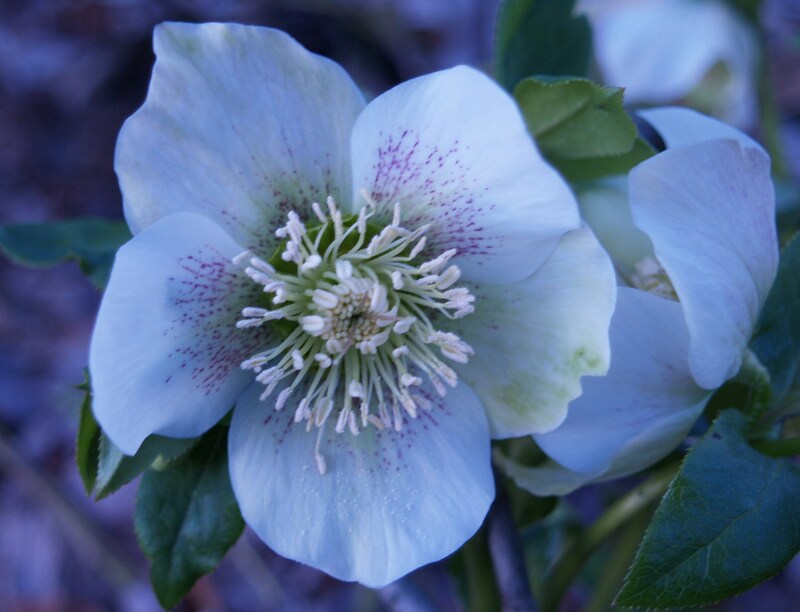 The blooms are treasured late in the winter, usually arriving shortly after the witch hazels have begun to bloom, though as the deep snow persisted in the shady areas of the garden this past February the blooms were delayed into early March. The foliage is evergreen, but will often turn quite haggard by early spring, so I will cut the older leaves back every second or third year. 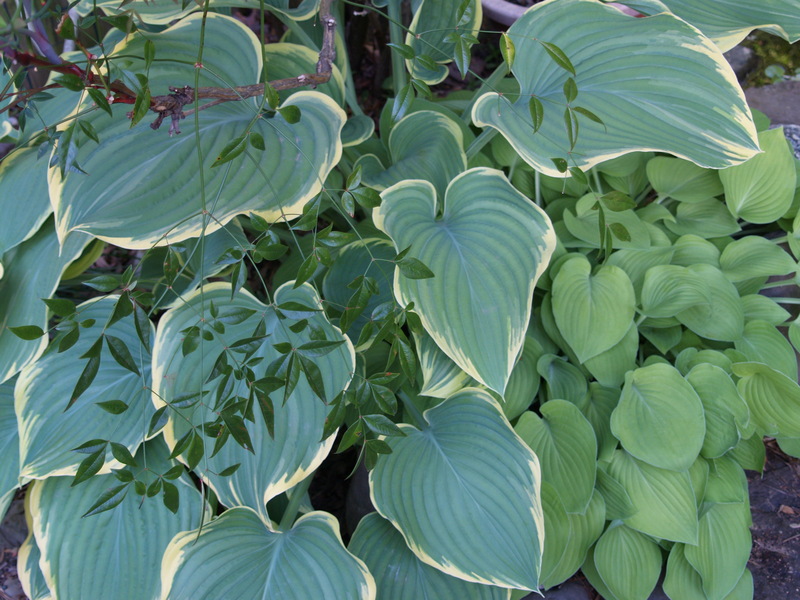 There are easily thousands of hosta varieties available for purchase by mail order from specialty growers, and often many dozens in the garden centers, but those in my garden readily seed themselves about with new babies sprouting each year. Thus far none have been notable, most with undistinguished green or bluish-green foliage, and one that is low growing with narrow, pointed, dirty, yellow leaves that are quite horrid, but it occupies an open space between two small granite boulders where few other plants will fit without engulfing the stones, so there it will stay. In their native habitat hostas are often found in damp shade beside streams, and a seedling has grown in a mossy crevice between stones at the edge of a small waterfall on one of the garden’s ponds. I presumed at the start that the spot would be too damp, but the dull blue-green hosta has flourished and is now quite large so that the falling water can be heard, but not seen. Quite often I cull out seedlings of nandina (Nandina domestica, below) as there will often be many hundreds growing beneath an established shrub. 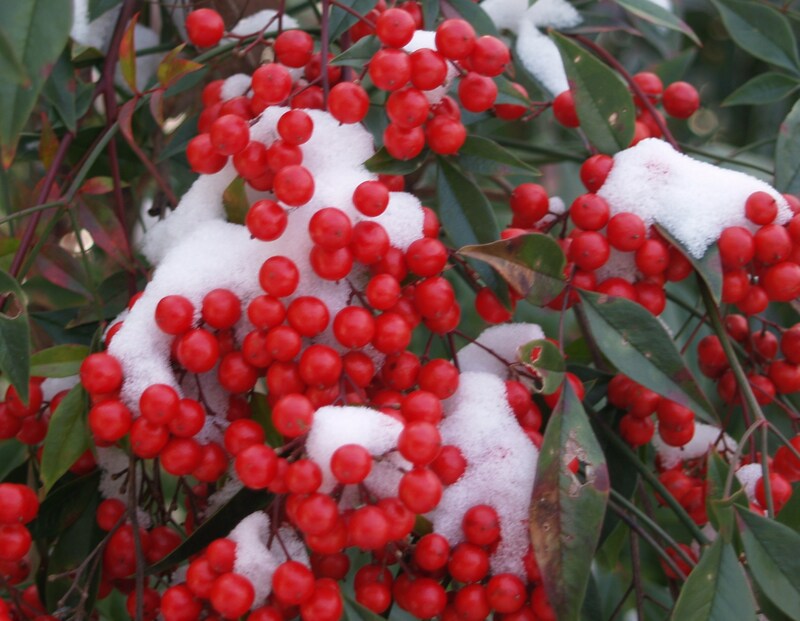 Some groups consider nandinas to be invasive, but the seeds do not travel far since birds often ignore the plentiful berries through the winter. Though nandina will flourish in sun or shade I have not found seedlings more than a few paces from the parent plants, and young plants are easily moved, or removed. 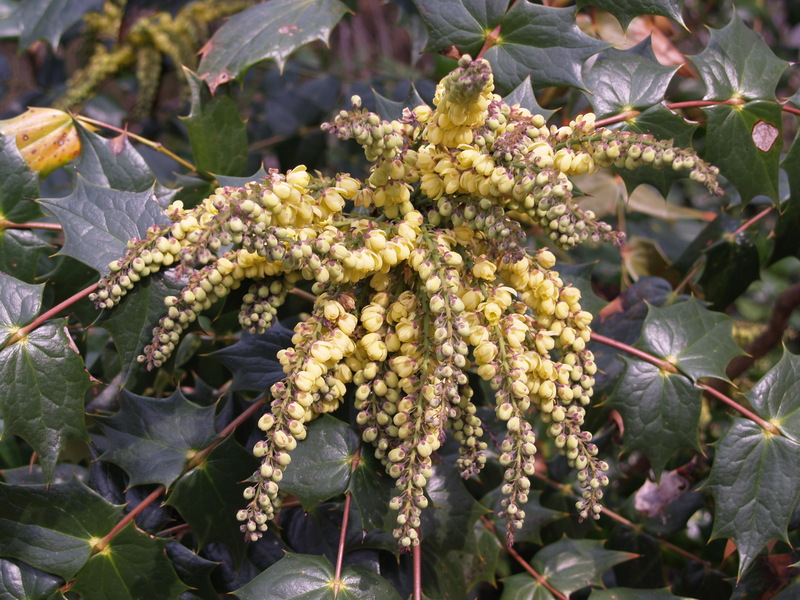 The spring blooming Mahonia beali (below) is not so easily moved without the sharply-spined leaves inflicting at least a few painful pricks, and I have found seedlings in the shade of shrubs and small trees. Since they will grow to a sizable shrub some sprouts must be removed, but a handful have been allowed to grow around the garden and now nearly match the parent plants in height, though they are only a single trunk and have not yet spread. Purple, grape-like fruits (below) follow the bright yellow, early spring blooms, which are then quickly consumed by birds and deposited around the garden and at the forest’s edge that borders the garden. 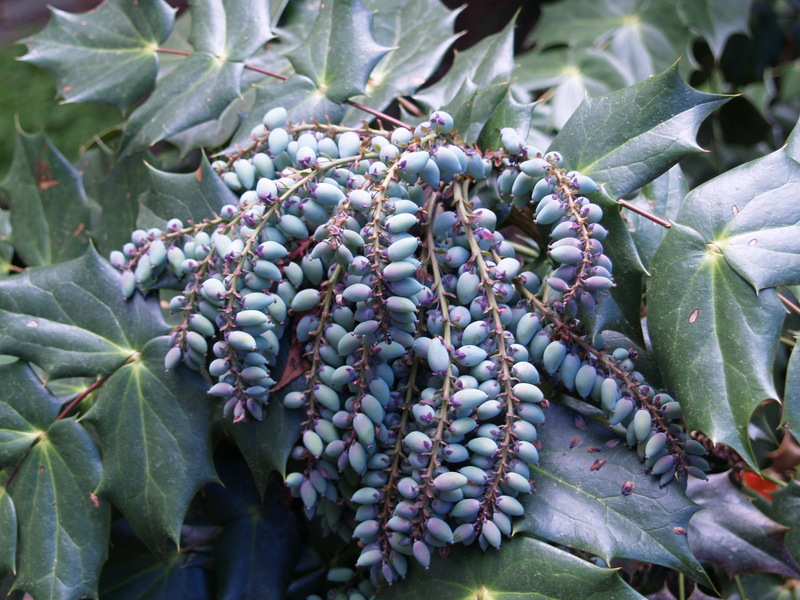 The number of seedlings has not proven so numerous, and the distance from the parent plants not so widespread to be of concern that the mahonia could be considered invasive. 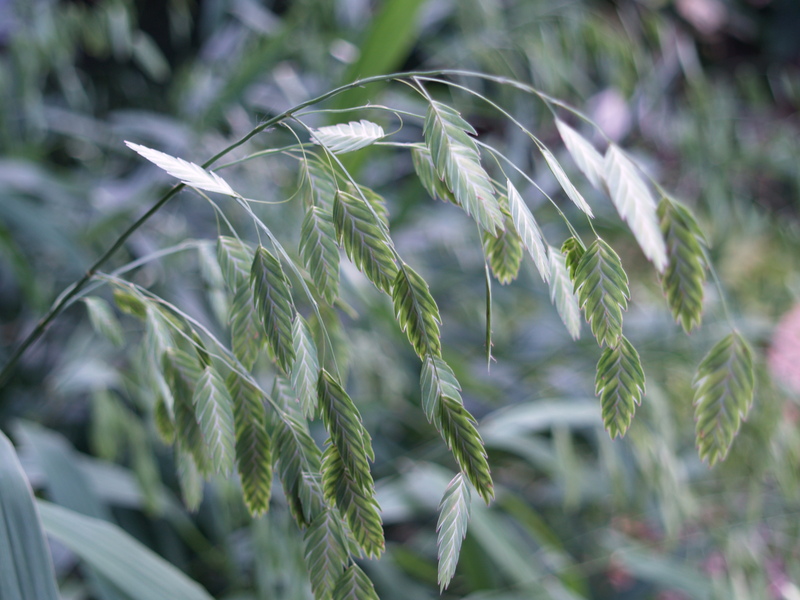 I have planted Northern Sea Oats (Chasmantium latifolium, below) through a ground cover of yellow Creeping Jenny (Lysimachia nummularia ‘Aurea’), and the number of seedlings that germinate in this partially shaded location is astounding. To remedy the overpopulation I cut the grass to the ground late in the autumn. 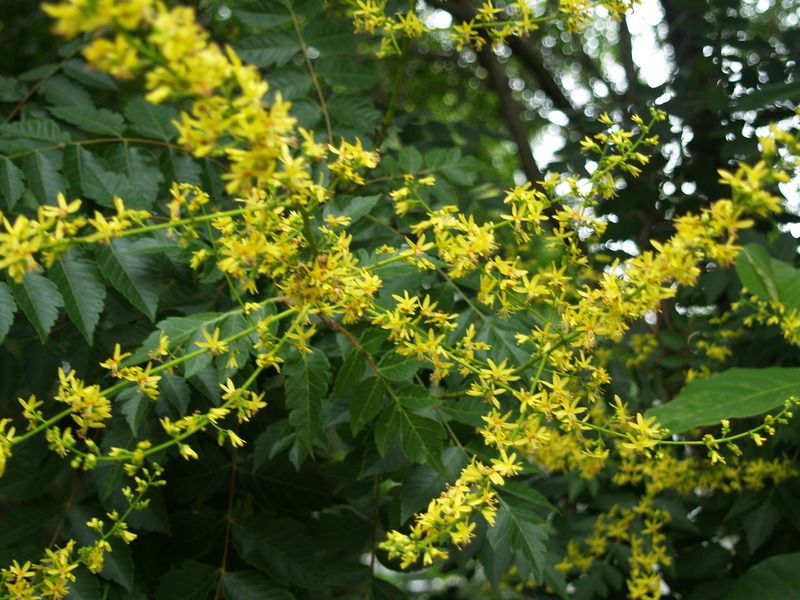 I am surprised that the Goldenrain Tree (Koelreuteria paniculata, below) is not recognized as invasive, for each year my garden is overrun with thousands, perhaps millions of seedlings which cover the ground beneath the tree like a ground cover, and often appear in numbers a hundred feet across the garden. The quantities are too great to pull by hand, so I have learned that a pre-emergent herbicide is required in early spring in the area in close proximity to the tree. Though the blooms and seed pods are delightful, one goldenrain is more than enough for this garden, and this is one plant in the garden that seeds itself about that I would advise against. Dave: your notes about plants that reseed themselves was very interesting, but the reason of my writing is to let you know that while reading, for a moment, I felt that this was early spring and I was ready to work outside, yes! you totally make me forget that I am in South Riding on a 27 degree day 🙂 Thank you and Happy Winter!